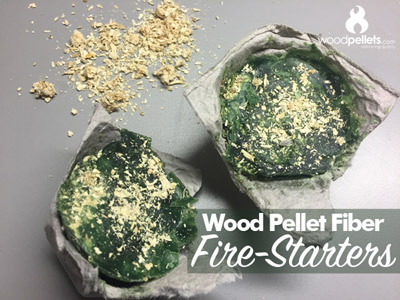 Sprinkle your dried wood fiber evenly into each cup in an empty paper egg carton, almost all the way to the top. Once your wax is liquified, carefully pour the hot wax into each cup to the brim right away. Wait a few minutes for the wax to cool a bit, then use a spoon to squish the mixtures down. Once that’s completely cooled, cut each egg cup to make individual fire-starters!